We are a UK-based, specialist tour operating company which designs and runs thematic tours exclusively in Greece. We are passionate believers in the miracle that is Greece and are equally passionate in the design and delivery of our programmes, all of which offer insights which resonate with the essence of Greece and which can foment thought, arouse the imagination and inspire interesting discussions during and after our tours. Our well-researched, perfectly-delivered and inspiring tours are conducted round-the-year and are all supported and escorted by our hand-picked specialist, licensed guides. 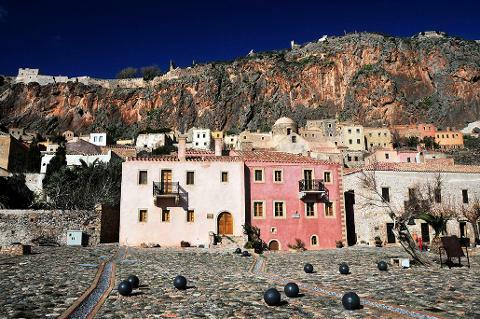 Specialist tour operator Eternal Greece Ltd offers an inspiring and illuminating ten-day­ guided tour of the fortresses and castles of the southern and eastern Peloponnese to FSG members. 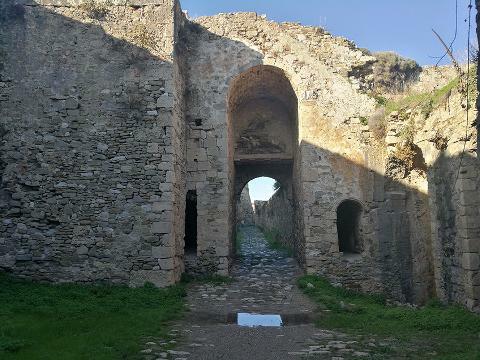 The tour will start on 18 May 2019 and will mainly look at Venetian fortifications but will also include Turkish, medieval and some celebrated sites of Classical antiquity, in the splendid Spring countryside of Greece. The organiser, Eternal Greece Ltd, is a UK specialist tour operating company which designs and runs thematic tours exclusively in Greece. The typical audience of this programme would include avid admirers and connoisseurs of history and military architecture (Classical Greek, Byzantine, Frankish, Venetian and Ottoman), Classical Greek archaeology, and also of natural beauty, who would relish the experience of seeing the most evocative sites and monuments in combination with the splendid nature of Greece. • Hotel accommodation for nine nights basis double sharing, including breakfast. Single room occupation available at a supplement of EUR 190. Price excludes accommodation tax, typically EUR 0.50 to EUR 3 / night, which is payable upon check out. The price excludes anything not explicitly mentioned in the inclusions above. 18 May: We will leave our central Athens meeting point in the early morning for our base in the vicinity of Pylos, travelling across the Corinth Canal, that magnificent feat of 19th-century engineering which transformed the Peloponnese from a peninsula to an island. Short pit stop for photos. Just a short distance after the bridge, we visit ascend the mighty Acrocorinthos, the acropolis of ancient Corinth. 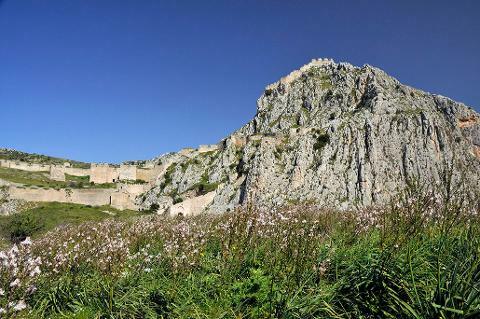 Crowned by an extensive fortress, Acrocorinthos is is a 575 m (1,886 ft) – high monolithic rock overlooking Corinth that was continuously occupied from archaic times to the early 19th century. The hill provides magnificent views to the Corinthian and the Saronicos gulfs, mount Helikon and mount Parnassus. Acrocorinth is an excellent specimen of incessant habitation from antiquity until the early 19th century. We will then continue to our first base, in the vicinity of Pylos. After settling in at our at leisure at our hotel, we will enjoy dinner at a typical Greek taverna. 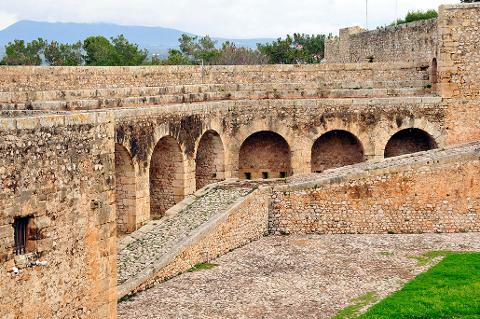 20 May: Visit the castle of Kyparissia and then on to illustrious Ancient Olympia, birthplace of the Olympic Games in 776 BC and home to the great sanctuary of Zeus. The archaeological site, surrounded by olive trees olive trees and vibrant nature, includes both sanctuaries and temples as well as the stadium and and gymnasia and training grounds used by athletes. Legend has it that the training grounds were founded by none other than the demigod and hero Heracles (Hercules) himself! The superb museum contains an extensive collection of ancient Greek weaponry and armour, the wonderful sculptures from the Temple of Zeus and the Hermes of Praxiteles, arguably one of the very few surviving works by one of antiquity’s greatest sculptors. Time permitting, short walk at Yalova lagoon and Voidikoilia cove on our return trip, both beautiful scenic spots. Overnight in the vicinity of Pylos. 21 May: This will be the day we encounter a series of magnificent coastal castles and fortifications in the south-western Peloponnese. 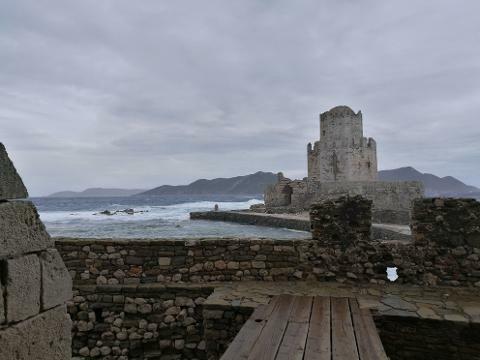 We will start the day with the castle of Methoni, known in the ancient days as Pedasos. The walled city of Methoni lies on a rocky headland separated from the mainland by an artificial moat. 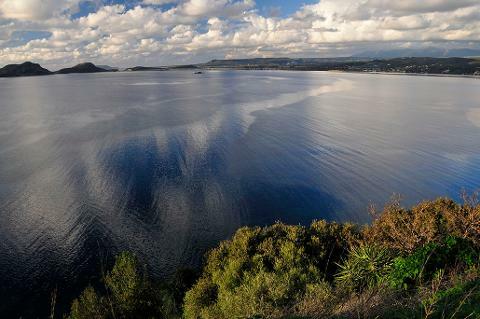 on the west coast of the Peloponnese around 7 miles south of Pylos. 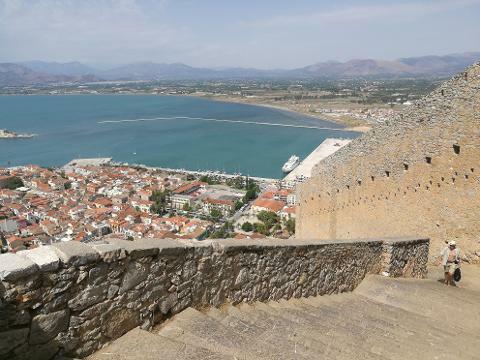 It is one of the most important castles (actually, a fortified city) in Greece and commanded a strategic position with its exceptional natural harbour being the first port of call for travellers approaching by sea from the south west. 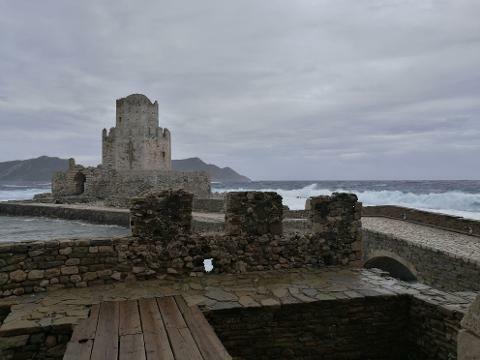 Still impressive today, the castle of Methoni occupies the whole area of the cape and the southwestern coast to the small islet that has also been fortified with an octagonal tower and is protected by the sea on its three sides. 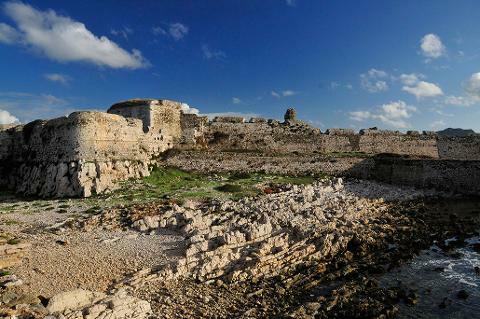 Its north part, the one that looks to land, is covered by a heavily fortified acropolis. 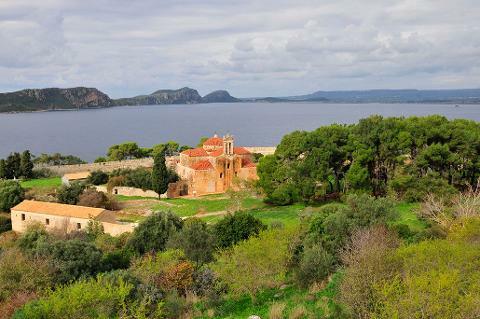 We will then drive to Koroni, a castle built on a rocky headland jutting into the Messenian Gulf. 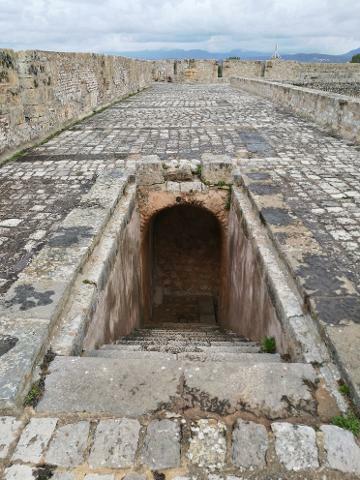 The site’s origins date back to the 8th century BC, but the castle now visible was constructed during the Byzantine era. Parts of the extensive site are still occupied today, though visitors are welcome to explore the surrounding walls and ruins. 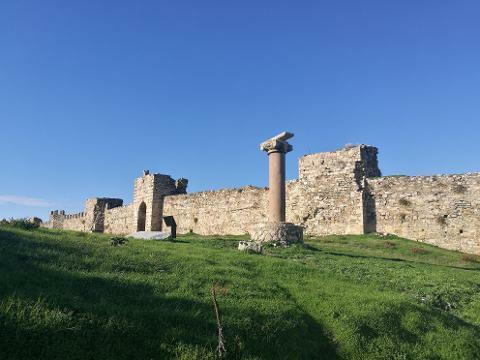 Scattered columns from the ancient Messenian temple remain as evidence of the distant past, next to the 4th century AD basilica of Hagia Sophia, the 17th century church of Agios Charalambos, and the church of Panagia Eleistria. This long, tiring, yet rich day will reach its end when we arrive at the seaside town of Kalamata, where we will spend the night. 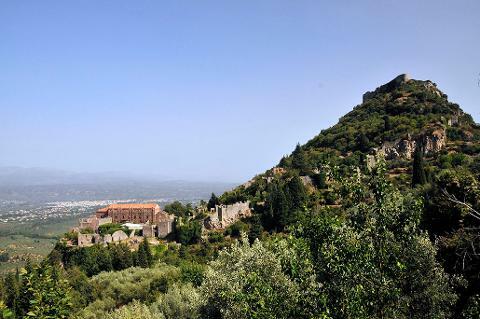 22 May: Visits to Kalamata and Androussa castles and, time permitting, to the wonderful archaeological site of Ancient Messene. 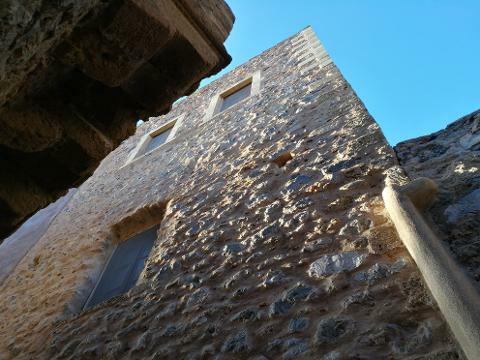 Overnight at Kalamata or Mystras. 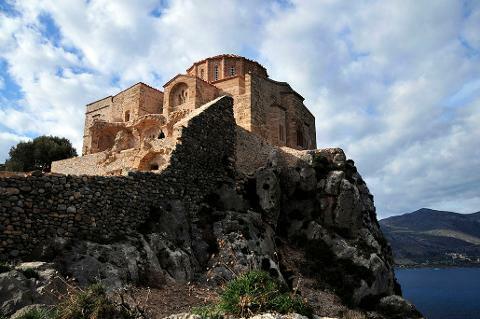 23 May: Drive across the legendary Taygetos mountain range, the highest in the Peloponnese to visit the extensive medieval site of Mystras. 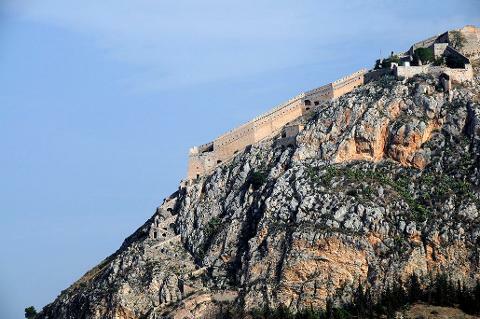 This is a renowned Byzantine citadel perched on the steep slope of a hill above the city of Sparta. Known as ‘the Wonder of Morea’, it has been listed as a UNESCO World Heritage Site since 1989. Mystras was once a thriving town that was the second most powerful town of the Byzantine Empire – second only to Constantinople, and is well worth our attention due to its significant role and colourful history during the last millennium from the time of the Crusades up to the beginning of the Greek Revolution against Turkish rule. Short stop at Ancient Sparta (Sparti) or Lacedaemon, which was once a rich and powerful city-state, famed for its military prowess. This was the place of legends, the city of mighty-warrior kings and where the epic myths of the war against Troy began when Paris, the prince of Troy, either abducted or eloped with Helen, ‘the face that launched a thousand ships’, the step-daughter of King Tyndareus of Sparta and wife of Menelaus when he was king of Mycenaean Sparta. Our day will include a visit to the Menelaion, in a spectacular setting overlooking the Laconian Plain and the Eurotas river. The Menelaion was built in honour of Menelaos and Helen, who became pan-Hellenic heroes through the distribution of Homer’s Iliad. 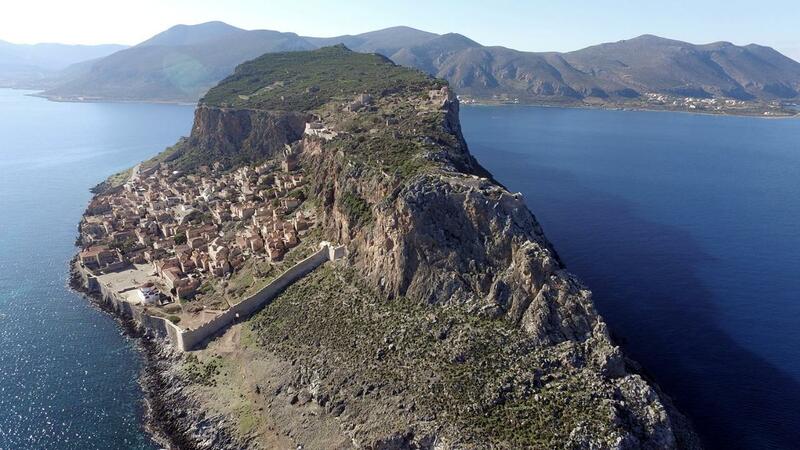 Drive to the remarkable castle-town of Monemvassia for our first overnight there. 24 May: The day is devoted to the exploration of this iconic destination, also known as the Gibraltar of the East and bearing a more than passing resemblance to Mont Saint-Michel in Brittany. 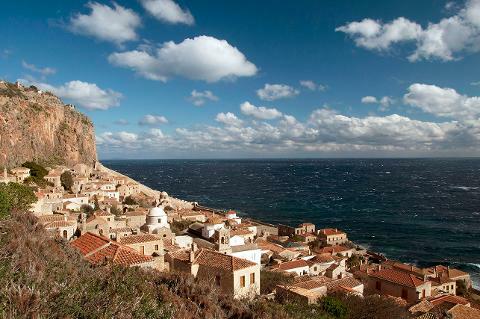 Monemvassia, its buildings restored and preserved, is still occupied today. We will walk up its winding streets to admire the historic walls of the upper town, the numerous Byzantine and Venetian churches and the Turkish mosque. As well as enjoying the views and ambience of this strikingly picturesque town, we will also visit a local winery producing the famous Malvasia wine. 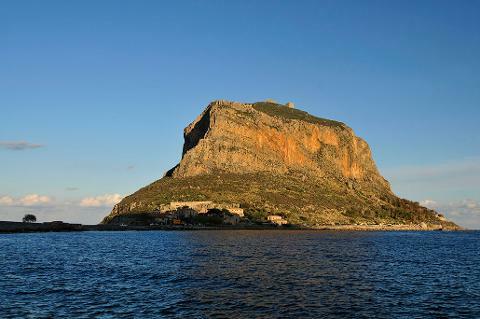 Overnight at Monemvassia. 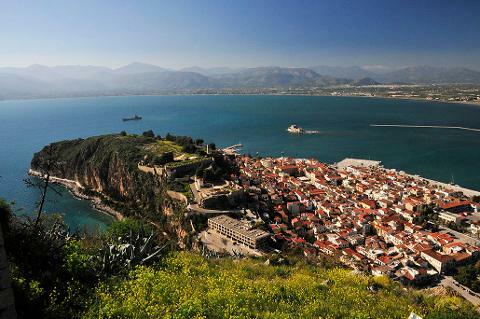 25 May: Drive to the picturesque sea-side town of Nafplio. 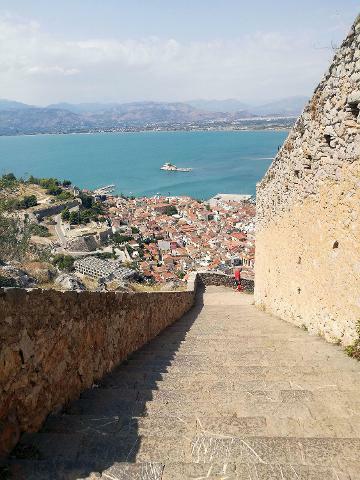 We may wish to either hop on our coach to explore to the Venetian Fortress of Palamidi above the town or, for the energetic, there’s always the option of climbing the 999 steps! 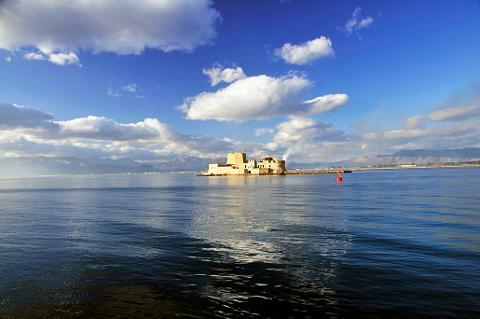 26 May: Visit to Boutrzi water-castle, which is situated a few hundred yards offshore of Nafplio town. 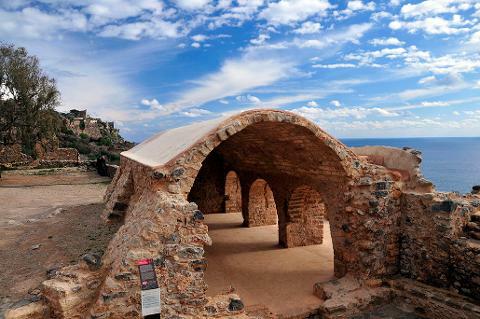 We then set off for the legendary Bronze Age site of Mycenae, with the imposing ruins of the greatest city of the Mycenaean civilisation, which dominated the eastern Mediterranean world from the 15th to the 12th century BC and played a vital role in the development of classical Greek culture. 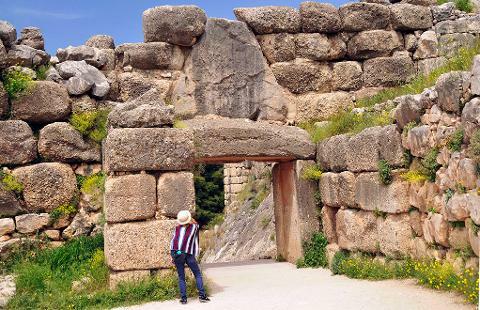 Mycenae, the city of King Agamemnon, with its Cyclopean walls, the Lion Gate and spectacular archaeological finds is a UNESCO World Heritage Site. 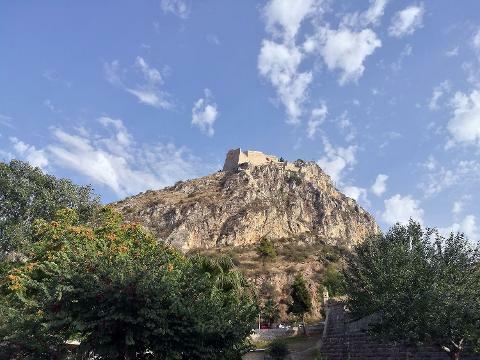 27 May: We start the day with a short drive to the hilltop where Larissa, the medieval Castle of Argos oversees the Argive Plain. 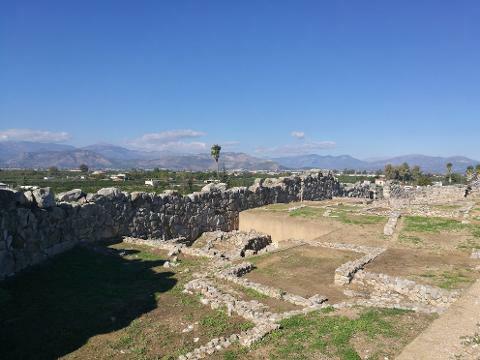 Ruins within Larissa point to the occupation of the site in the 6th century BC, but it may be much older, not least as the town of Argos itself has been occupied for at least 7,000 years, rendering it one of the oldest settlements in the world. 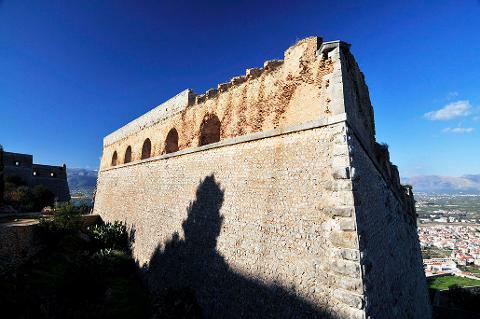 One can still see the remarkable Cyclopean wall sections of Larissa, dating all the way back to the Mycenaean period, while imprints have also been left by the Romans, Franks, Venetians and Ottoman Turks. 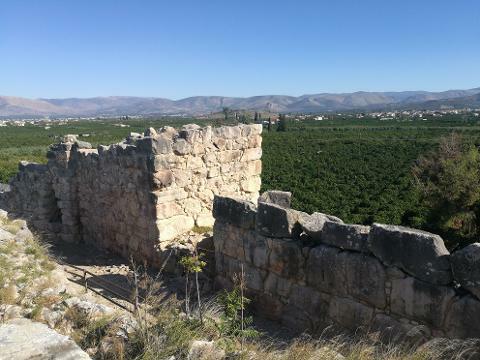 Return to our central Athens dispersal point via Ancient Tiryns, a UNESCO World Heritage site.